does anyone know who the knights are / were - specifically, the bearer of the arms of an oak tree supported by two crows? Also are the arms which appear to bear a reversed trefoil vert correct or has the flag been reversed? I have split this from the thread about Sir R menzies CoA as it refers neither to him nor to Knights of the Thistle generally. There have been only a score or so of Garter knights since WW2 so it shouldn't be too hard to find the answers to Iain's questions. Well, here's a thing. None of the banners shown correspond with any of the current members. These are banner of knights of the Order of the Bath. Several of them, including the one with anchors and the globe, can be seen opposite page 53 in Friar's New Dictionary of Heraldry. To try to regain some logic to this subject I have now opened this thread in "Flying Heraldry" and moved the material from "Garter Banners". 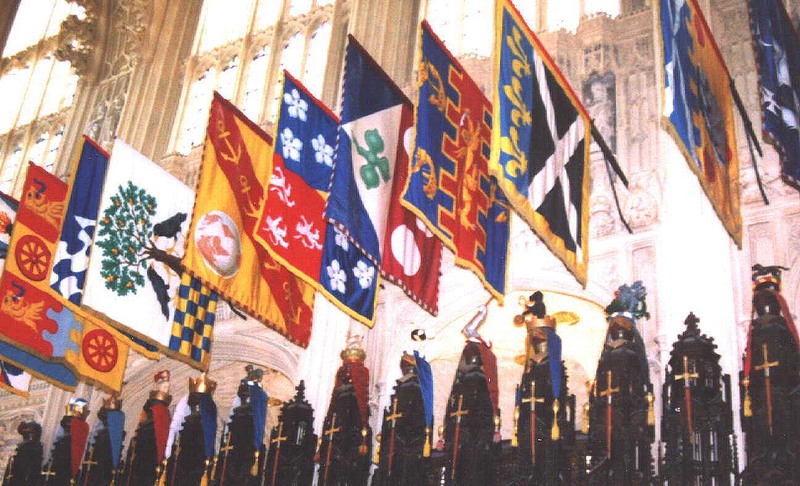 Strangely the picture we now learn - thanks to Arthur's sharp eyes - to be of banners of the Order of the Bath, originated in a web-site belonging to Ian Brennan, one of the world's leading heraldic sculptors. 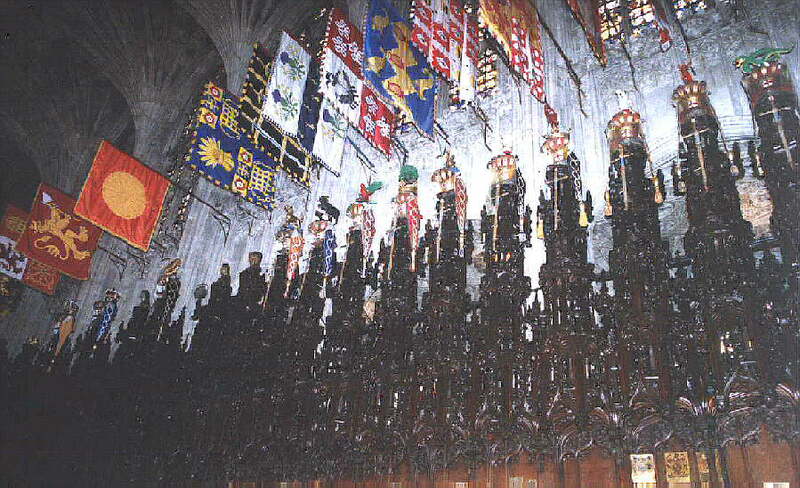 It is labelled "Garter Banners", although another similar picture is correctly shown in the section on the Order of the Bath. Here is a picture of Garter banners also from Ian Brennan's site. Note that the banner of the King of Norway is "show through" although the cloth of the banner is apparently double thickness silk. Chris Green wrote: Here is a picture of Garter banners also from Ian Brennan's site. Note that the banner of the King of Norway is "show through" although the cloth of the banner is apparently double thickness silk. If the banner is double thickness, then perhaps it is "double-sided" rather than "show through", as the design would have been embroidered or printed on both pieces of silk, one the right way round and the other in reverse. Probably a bit pricey, but then it is the Order of the Garter, after all! I am not finding it easy to explain, but to me "show through" naturally occurs when a single thickness cloth is printed and the image can be seen mirror-wise on the reverse. Thistle banners are like this. "Show though" also appears to occur, as Arthur says, when the reverse of a double thickness banner is embroidered mirror-wise. In vexillology, it is taken as the default for charges on the reverse of a flag to be mirror-imaged from those on the obverse, whether printed or stitched on a single thickness of cloth or embroidered on two thicknesses. The term "double sided" is used for those exceptional cases in which the reverse is not a mirror image of the obverse, e.g., in the arms of Saudi Arabia where the Muslim creed must read correctly on both sides and the point of the sword must be to the viewer's left. This, of course, mirrors (no pun intended) the correct heraldic usage, in which charges that face to dexter on a shield face toward the hoist or staff, regardless of which side of the flag they're on, and those that face sinister on the shield face toward the fly on a flag.